From what we can tell, the last time Google updated the stats was back on October 26, 2018. That was 158 days ago, resulting in more than 5 months of no official information on the Android distribution stats. 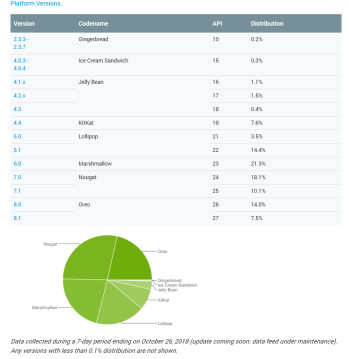 Has Android Pie been adopted by more than 4% of all Android devices? Has Nougat overtaken Marshmallow as the most widely-spread version of the OS? We wouldn’t know, as the horse’s mouth is dry. Surely, there has to be a piece of information to give us an idea why the stats haven’t been updated for so long, right? Of course! Google conveniently points out that, you see, there’s an “update coming soon: data feed under maintenance”. That’s a pretty legit reason for a small delay of, say, a couple of weeks, but this maintenance message has been idly sitting there since December, with the page itself being last updated on December 11. Yep, I checked. For one, Google is essentially preventing us from having any insights on Android Pie’s early adoption. Once the distribution table gets updated (and it most likely will be), Pie will probably be comfortably sitting at the 4-5% mark as most Android manufacturers have already updated many of their devices to the latest official version. However, the adoption rate right after the release of Android Pie would have given us precious data on how well Google’s Project Treble is doing. As you probably remember, Project Treble promised way faster software updates for non-Pixel Android phones by modularizing code and making it easier for OEMs to push updates. In other words, Project Treble wanted to cripple Android fragmentation. However, by not releasing Android distribution stats, Google is keeping Project Treble tucked in the closet and not letting it come out until it’s old enough to be in pre-school. Lame! Another somewhat unlikely reason forGoogle’s unwillingness to fix its distribution stats tool might be business competition. Now that Google really wants to be a hardware company like Apple and Samsung (which it is hardly at the moment), it might be not sharing Android distribution stats to… prevent its competitors and business analysts from guesstimating how many Pixel phones have been sold. A long shot, but not entirely impossible. It won’t be a precedent either – Apple, for example, no longer shares sales numbers for all of its products. However, think of the developers, the backbone of Android. These stats might not be a terribly-vital part of the app development process, but definitely come useful when you’re simply lacking the budget of the big boys on the scene. Perhaps a little transparency on Google’s side would have been enough to clear the air and diminish this issue. It’s too late now and it would get a bit awkward, but hopefully this would be addressed at the upcoming Google I/O developer summit. After all, it’s a developer-centric event and this data is important for developers, so… fingers crossed… maybe? 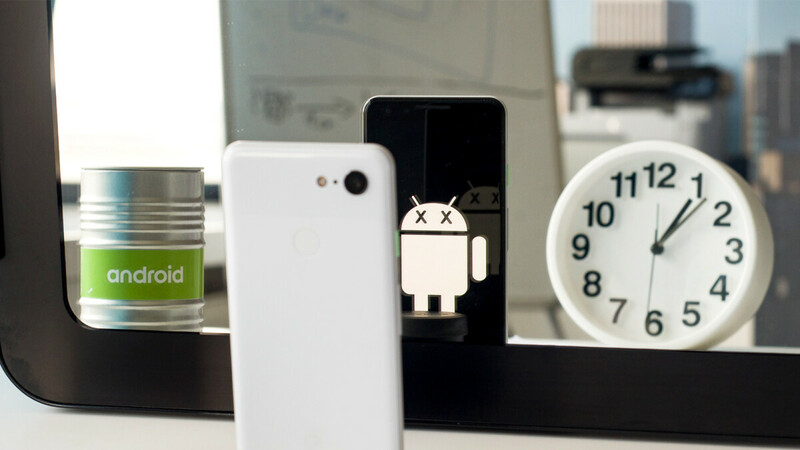 “Either they don’t care about it or they are waiting until decent percentage of phones come to android P so they can say project treble is a huge success, ” says redman1037. erikivy jokingly says, “Perhaps they will update it when the numbers change”, which is a rather sick burn. Says kaszak696, “It’s a Google service, so it’ll probably stay like that for 3 years and then it’s gonna get cancelled.” This hits very close to home, especially in the wake of the recent demise of both Inbox and Google+.